NEW ORLEANS – Many teams in NCAA Division III Cross Country elected to rest their legs this past weekend in advance of the biggest weekend of the 2017 season to date. 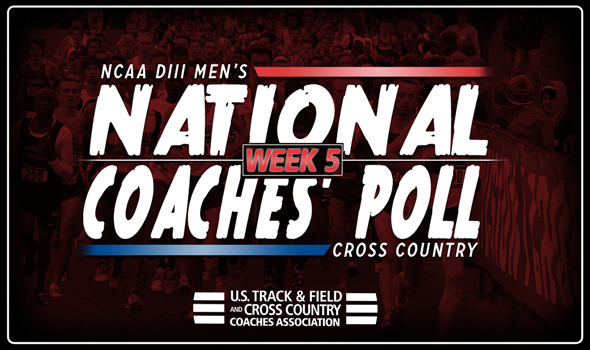 Therefore, the NCAA Division III Men’s Cross Country National Coaches’ Poll remained virtually untouched between Week 4 and Week 5. The most recent poll that was released Wednesday by the U.S. Track & Field and Cross Country Coaches Association (USTFCCCA) saw a stagnant top-15 and just a few new teams added to the weekly 35-team index. Carnegie Mellon leapfrogged Johns Hopkins in the poll as the former went from No. 17 to No. 16 and the latter from No. 16 to No. 17. The Tartans fared better than their region mate at the Paul Short Run two weeks ago, as their top-7 runners covered the 8K tract in better times than that of their counterparts despite being in different races. There are three new teams to the poll a bit further down at No. 35. Yes, three teams tied at No. 35 this week: Case Western Reserve, Messiah and Tufts. The Jumbos are one of seven teams from the New England Region in the top-35 this week, which leads all regions. Next up is the Midwest Region with six, followed by both the Atlantic Region and Mideast Region with five. The Central Region and Great Lakes Region both have four teams, while the West Region has three and the South/Southeast Region has one. You’ll want to check back in later this week as we’ll preview this weekend’s action, headlined by the Cowbell Invitational hosted by Principia College in Elsah, Illinois, which serves as this year’s Pre-National Invitational.